Last Saturday, June 15th, author E.M. Tippetts showed up on the Kids' EBook Bestseller List. 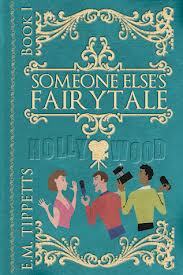 Her book, Someone Else's Fairy Tale, hit the number 7 spot in the Teen section of the Barnes and Noble Nook store. Emily Tippetts joins us to talk about the e-success of her book, the first o two books in her Fairytale Series. First, let's hear what your story is about. Hollywood A-lister, Jason Vanderholt, falls for everygirl, Chloe Winters. She becomes the woman every other woman is dying to be, but it just isn't her fairytale. She doesn't even believe in fairytales. I write science fiction and fantasy as Emily Mah and have sold short stories to various magazines and anthologies. My first work as E.M. Tippetts was an LDS (Mormon) chick lit book that I sold to a small press in Utah. I decided to take that pen name indie, for the fun of trying the indie route, and Someone Else's Fairytale went live in December 2011. It has since been on the Kindle top 100 twice. My continued study of the market and how bookselling works. When Fairytale first came out, Twitter marketing was very effective, and I got Fairytale to #194 on Amazon this way. Then things changed and it was a combination of factors that got the book to 51st on Amazon the following December: the book was chosen by Amazon for a price promotion, Pixel of Ink featured it, and BookBub gave it a free ad. This last time it climbed the ranks to both the Amazon and Barnes and Noble top 100 lists was when I placed another BookBub ad. Right now those are very effective, and I'll keep watching for the next market shift. I've always used Twitter to meet and engage with people, and that used to sell a lot of books, but no longer (not that I mind, I still like meeting people). I've since become more active on Facebook and started up my own mailing list, but I'm not the sort of person that emails out updates very often. People on the list will hear from me as I build up to another book launch, but I'm pretty quiet otherwise. Mostly, I make myself accessible on social media, if anyone wants to talk to me. I try not to make a pest out of myself! Light romance has an extremely broad target audience and Fairytale has fans aged eleven through ninety-seven. Much to my surprise, quite a few men have read it and left positive reviews, which shows they don't mind the whole world knowing they read it. The logical taget market is women in their early teens through late twenties who are looking for an easy read that isn't pure formula. I thought that, because it was revolutionizing the publishing industry, I wanted to be a part of it, even if I didn't sell any books. I wanted to someday tell younger generations of authors that I was there, participating when the very first indie books cracked the bestseller lists, and I have no regrets whatsoever. It's been a fantastic experience through and through. I even got to draft one of the first ever indie translation deals, which led to Fairytale being translated into German and it *almost* cracked the Amazon.de top 100. It got to #113. But no matter. The German edition book still has its place in history as one of the first of its kind. I wouldn't have predicted that, a couple of years in, I'd be someone younger authors ask advice from. Given how new indie publishing is, you don't have to have been doing it all that long to have relatively more experience than everyone else trying it out. I still consider myself a new indie author, but I was well ahead of the big rush to go indie that happened in 2012. Yes, the book's available in print on demand through CreateSpace. I did that around the same time I released the ebook so that I would have something to sign and give to family and friends. And I've made a little side income through selling it too, but the ebook is where i see the real sales volume. Hence, the ebook was my publishing plan from the beginning. That was a format I could price low and thus reach a wider audience with. I don't think print publishing will ever go away, but e-publishing already had become the market sector with more sales volume. I think this is because the books are so much cheaper, and yet the authors still tend to make more per sale, so it's a win-win. As for whether it will ever catch on with children, that will depend on the availability of e-readers to younger people. Such ereaders would have to be cheaper and more durable, so I think it'll be a while yet before ebooks take over that segment of the market. It only helps authors to have another set of rights and another potential income stream, and because ebooks can be produced with zero marginal cost, this means it's a market outlet accessible to everyone with a computer and the ability to format an ebook (or to pay someone to format it). More people can get published these days, and make their own publishing destiny. It's hard to see how it could hurt any readers. I know there are a lot of people who bemoan the death of the physical book, but I just don't see that ever happening. Paperbacks are still widely available at the same prices as ever, but now it's possible to get ebooks for cheaper, delivered instantaneously to your ereader at any hour. The average ereader owner reads four times as many books as someone without one. While I know there's a lot of prejudice against ebooks for young children, I can't yet tell how much of it is just resistance to change. Parents need to be as diligent as ever to know what it is their kids are reading. I think it provides everyone, kids included, with another option. It means parents need to find new ways to be vigilant, but, speaking as a parent, that's inevitable in all types of media consumption. It'll be interesting to see how children's literature changes without publishers being the only parties to decide what books see print; I can't even begin to speculate there! Find our more about Emily Tippetts and her books at her website or by following her on Facebook, Twitter or Goodreads. Check this week's updated Kids' EBook Bestseller List for all the best in summer reading!